We all have a soft spot for the sticky-sweet chicken that’s a staple of takeout dinners. But it’s not exactly a meal for any night of the week—until now. We’re swapping out the heavy glaze for a fresh burst of ginger and a swirl of honey and soy sauce. 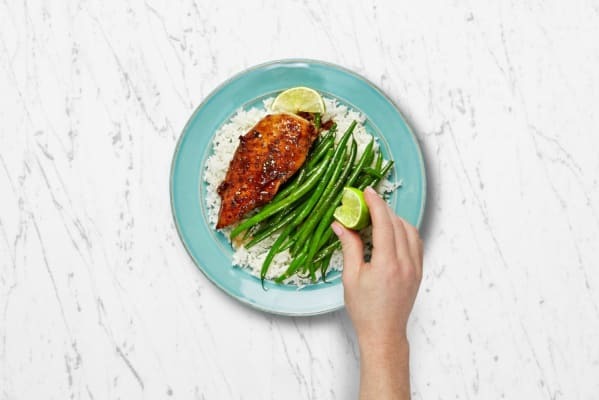 Served with tender green beans on a bed of jasmine rice, it’ll give you a good reason to toss out the phone number for your delivery joint. Bring 1 cup water and a pinch of salt to a boil in a small pot. Wash and dry all produce. Mince garlic. 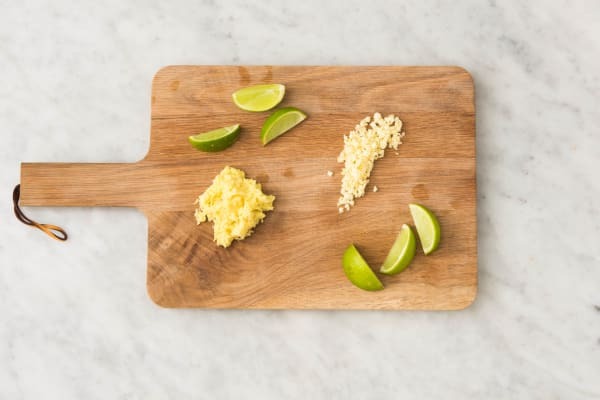 Cut lime into wedges. Peel ginger, then mince until you have 1 TBSP. Once water boils, add rice to pot. Cover, lower heat, and reduce to a gentle simmer. Cook until tender, about 15 minutes. Meanwhile, heat a drizzle of oil in a large pan over medium-high heat. Season chicken all over with salt and pepper. Add to pan and cook until no longer pink in center, 4-5 minutes per side. Remove from pan and set aside. 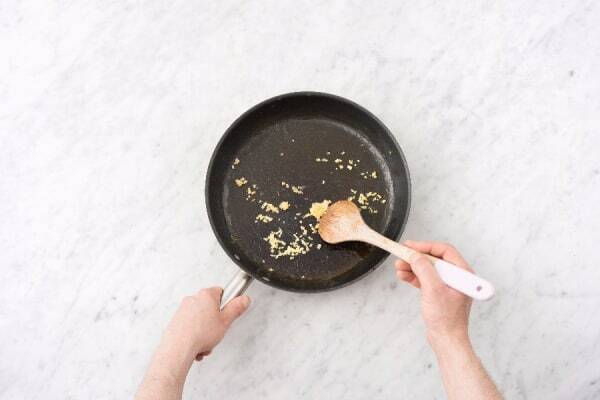 Reduce heat under pan to medium low and add a drizzle of oil. Add minced ginger and garlic. Cook, tossing, until softened and fragrant, about 1 minute. Pour in 1½ TBSP vinegar (we sent more) and let reduce until almost dry and evaporated. Stir 1 TBSP soy sauce (we sent more), 2 TBSP water, stock concentrate, and honey into same pan. Let simmer until mixture thickens to a glaze-like consistency, 2-3 minutes. 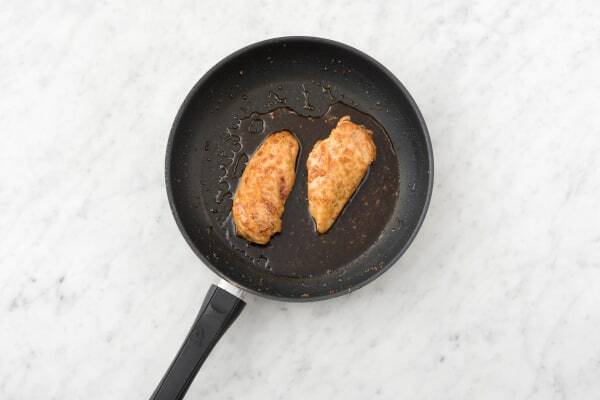 Remove from heat, then return chicken to pan and toss to coat. Set aside until rest of meal is ready. 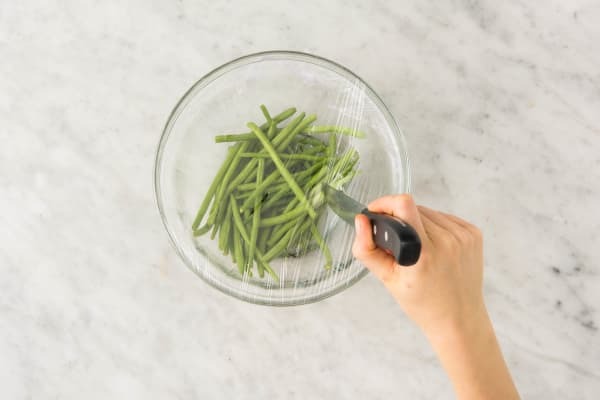 Place green beans in a medium microwave-safe bowl with a splash of water. Cover bowl with plastic wrap and poke a few holes in wrap. Microwave on high until just tender, about 2 minutes. Meanwhile, heat a drizzle of oil in a medium pan over medium-high heat. Thoroughly drain green beans, then add to pan. Cook, tossing occasionally, until lightly crisped, 3-5 minutes. Season with salt, pepper, and a squeeze of lime. Divide rice between plates. 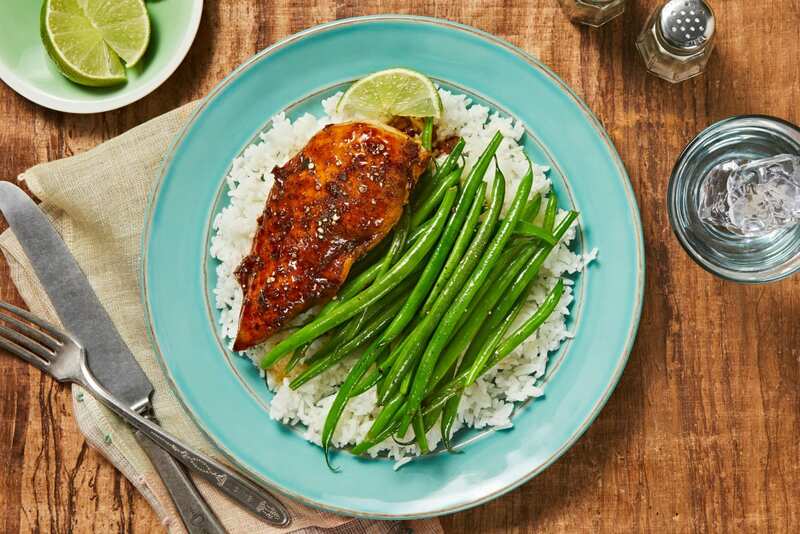 Top with green beans and chicken. Serve with remaining lime wedges on the side for squeezing over.